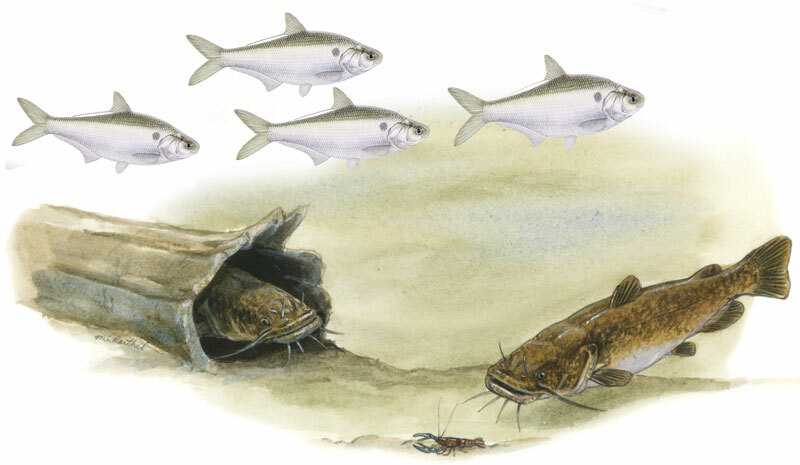 Aquatic habitats are communities in which complex interactions take place among populations and individual organisms as they compete for limited resources in an interdependent web of relationships. What are some of the basic survival needs of all living things? What is a population? What is a community? What is habitat? Why is it important? Why must organisms compete for resources? What is carrying capacity? What is a niche? Why is it important? What are invasive species? Why are they a problem? What is the source of energy for aquatic communities? How does energy circulate among organisms in an aquatic community? What is a food chain? What is a food web? What is an energy pyramid? What is a trophic level? How do predator and prey species keep species populations in balance in aquatic communities? What is natural selection? In what ways might food webs, food chains, and predator-prey relationships be different in a pond, an estuary, and the Gulf of Mexico? What happens when one piece is altered or removed? What do you need to survive? You need air to breathe, clean water to drink, food to eat, and shelter to protect you from the elements. These are basic survival needs for humans. For aquatic organisms to survive, they must be able to meet all of their survival needs just as you do. In addition, while it does not influence the survival of any one individual, reproduction must occur for a species to continue to exist. A group of individuals of the same species living in the same place at the same time is called a population. A group of the same kind of algae, a group of the same species of mussels, or a group of red-eared slider turtles are all examples of populations you might find living in a river. Several species living in the same place is called a community. The algae, mussels, and turtles—along with all the other aquatic organisms living in or around the river—interact with each other and make up a river community. The physical environment that a species needs to survive is called habitat. Yet, habitat is more than a place. Habitat is the shelter a species uses to escape predators and the elements. Habitat is the space a species needs for reproducing and for containing all the individuals in the population. And habitat includes the food a species needs for hunting, gathering, or producing. It includes all the things a species needs and most or all of what it prefers. Good habitat provides everything a species needs to survive over time. This includes things like appropriate temperature and adequate dissolved oxygen as well as things like cover (e.g., logs and aquatic vegetation) or a particular bottom substrates. For example, channel catfish are native to Texas and are well-adapted to Texas’ warm climate and aquatic habitats. Survival of any population of aquatic organisms, or of a species over time, depends on having suitable habitat. If conditions in the habitat change, populations must either be able to adapt to the new habitat or move to another habitat in which they can survive. Aquatic plants and animals that have very specific habitat needs are called specialists. Specialists are the most susceptible to being harmed by changes to their habitat. These species are often unable to move or find another suitable habitat and therefore have difficulty surviving over time. Generalists are able to survive in a wide range of habitat conditions. Rare and endangered species are often specialists that have been unable to adjust well to changes in their habitat. Within a community every species has a particular niche. A species’ niche defines how a species fits into its environment. It includes its way of getting food, the habitat it needs, and the role it performs in the community. Texas’ diverse aquatic environments provide many different niches. For example, gizzard shad and largemouth bass both make their homes in Texas’ large reservoirs. Gizzard shad, however, feed mostly by grazing on microscopic plants and animals called plankton. If necessary they can also eat small aquatic invertebrates. A largemouth bass hunts and eats other fish and crayfish. However, when bass are very young and small, they too seek plankton and small aquatic insect larvae. These two fish species live in the same reservoirs, but they eat different things. They do not compete for the same food, except for a very short period of time when bass are very young. There is sufficient food resource for both species to survive over time because the bass and the shad occupy different niches in the same environment by eating different foods. 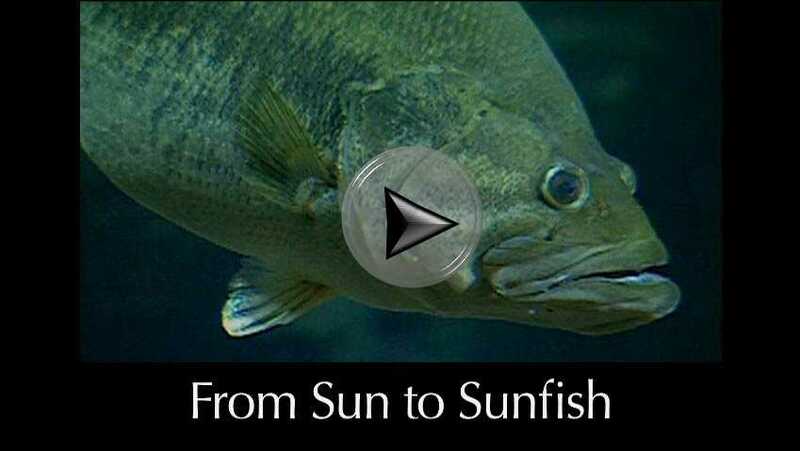 Largemouth bass and gizzard shad also have very different places and ways to breed. Largemouth bass spawning begins in the spring when water temperatures reach about 60°F. Depending on location in Texas, this can be as early as February or as late as May. Male bass build a circular nest about twice as far across as the bass is long. Nests are usually in water about two to eight feet deep. Once a female largemouth bass lays its eggs in the nest (between 2,000 to 43,000 eggs!) she is chased away by the male who then guards the eggs. The young hatch in about 5 to 10 days. The newly hatched fish are called fry. The fry remain in a group or “school” near the nest and under the male’s watch for several days after hatching before swimming off on their own. Gizzard shad also spawn in shallow water in spring when water temperature reaches about 60°F, but that’s where the similarity with bass ends. To reproduce, gizzard shad males and females school together releasing milt and eggs simultaneously near the surface where the eggs are fertilized. Once fertilized the eggs become sticky. The eggs are carried by water currents and as they slowly sink to the bottom they adhere to underwater objects as they fall. A single female can release as many as 400,000 eggs. These hatch in about 4 days. Immediately after being hatched the fry form schools and swim away. Gizzard shad don’t have nests or any parental involvement, thus the shad and bass occupy different niches of the environment in how they reproduce. As the young gizzard shad hatch and mature they become food for the young largemouth bass once they switch from a plankton to a fish diet. Living organisms have the capacity to produce populations of an unlimited size if they have unlimited food and other necessary resources, but this is a situation that never exists for very long. 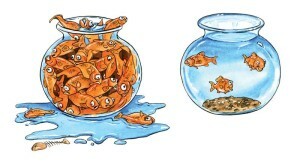 When there is not enough of something to go around, individuals must compete for whatever becomes scarce. If it is something necessary for survival or desirable to the individuals of any one species, some or perhaps all individuals can be adversely affected. Individual bluegills in a pond compete with one another for food. Populations of species within a community may compete against one another as well. Bluegills in a pond compete with green sunfish, since both species are similar and feed on the same prey. This spells trouble for both species when food is scarce. The amount, extent, or quality of biotic (living) and abiotic (non-living) resources needed by a species in any one place determines the environment’s carrying capacity. Carrying capacity is the maximum number of individuals in a particular population that an environment can support. When there are more resources than a particular population can use, the population is “below carrying capacity” for that particular environment. When this happens, individuals can continue to grow and reproduce. Aquatic communities, like almost all natural systems, run on sunlight. Plants and algae capture the sun’s energy. Then by the process of photosynthesis, plants and algae use energy from the sun’s light to make food and oxygen for themselves out of basic environmental resources like carbon dioxide, minerals, and water. Plants and algae are called producers because they produce their own food. Unlike plants, animals cannot make their own food. To survive they must eat other living things. Animals that eat plants are called primary consumers, or herbivores. A pond snail is a primary consumer because it eats algae and other aquatic plants. Secondary consumers eat primary consumers. Bluegills are secondary consumers—they eat insects, crustaceans, and small fish. Secondary consumers can be carnivores or omnivores. Carnivores eat other animals. Omnivores eat both plants and animals. Parasites such as leeches get their energy directly from feeding off of other living organisms, but they usually don’t kill the organism in the process. Scavengers such as crayfish eat the organic material of dead plants and animals. Decomposers such as bacteria and fungi also feed on non-living organic matter often called detritus. In the process they break it down into simple molecules that plants can use. Scavengers and decomposers play a vital role in recycling the energy and materials from the flesh of dead organisms directly back into the ecosystem for producers and other consumers to use. Energy moving from producers to primary consumers to secondary consumers and so on is called a food chain. Food chains describe what eats what. For example, zooplankton may eat phytoplankton, gizzard shad may eat zooplankton, and largemouth bass may eat gizzard shad. While such descriptions of energy flow through a community of plants and animals may be easy to understand, it is only a simplified version of how energy really moves through a community. Most animals have many sources of food at any point in time. Their food source may vary by life stage, size, and season of the year. Each food source may feed many different kinds of animals. 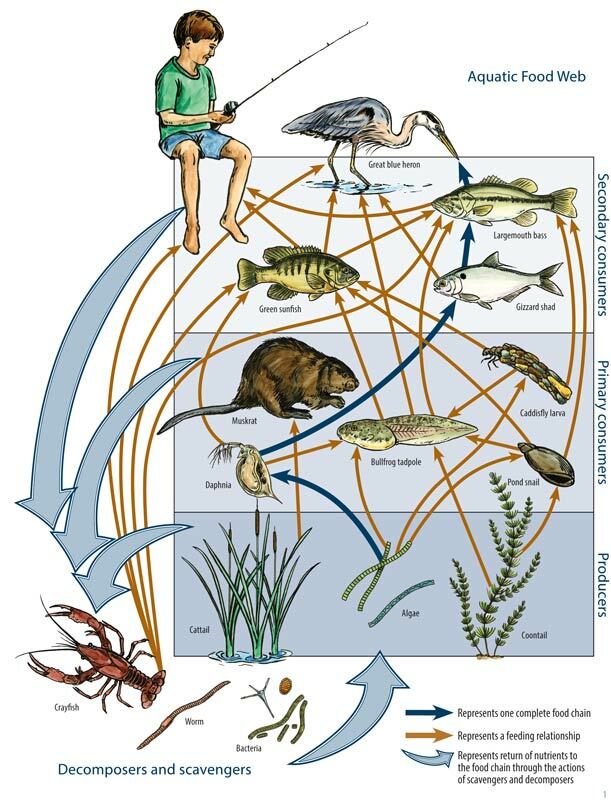 To illustrate this, food web diagrams show how different food chains are interconnected. (Fig. 5.3) Taking out any link in a food chain may upset the balance of the whole food web. An energy pyramid is another way to look at feeding relationships and energy flow through an ecosystem. Energy comes from the sun. The largest number of species and the greatest amount of available energy is in the producers that take the sun’s energy and produce food. This forms the base of our energy pyramid. As we move up the pyramid, energy is transferred up to organisms at higher levels. Energy is also transferred out of the pyramid at each step, and fewer species and individuals can be supported. The smallest number of species and least amount of energy is in the carnivores and top predators. The pyramid shape not only shows us what eats what, but how much energy is available at each level in the environment. Some energy is lost at each step away from the source of energy, the sun. The groups of organisms that occupy the same position in a food chain, such as the producers and consumers, are called trophic levels in the energy pyramid. 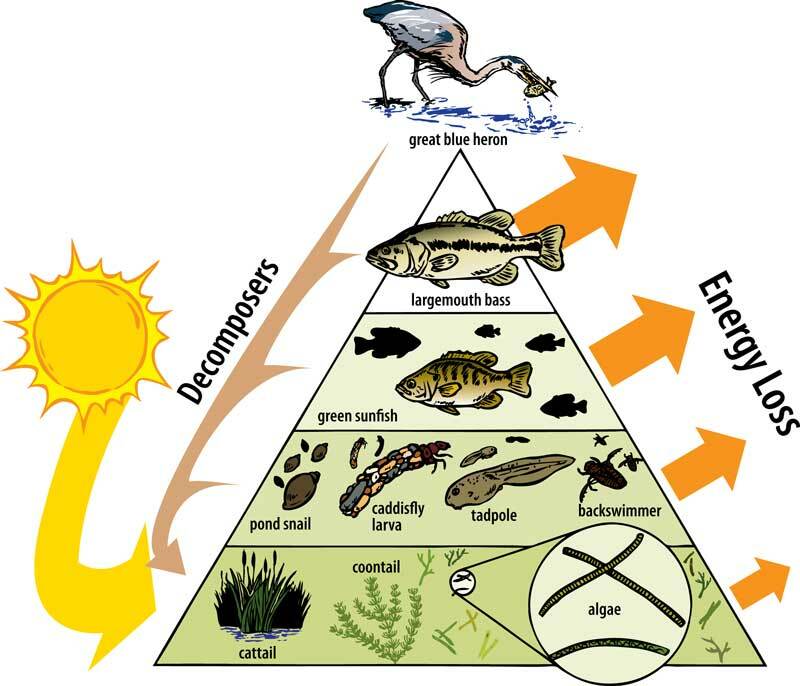 Trophic levels describe the steps in the energy pyramid and organisms’ roles at each level. Only a little of the sun’s energy passes from one trophic level to the next. (Fid. 5.4) Animals lose energy doing tasks such as hunting and keeping their bodies warm. 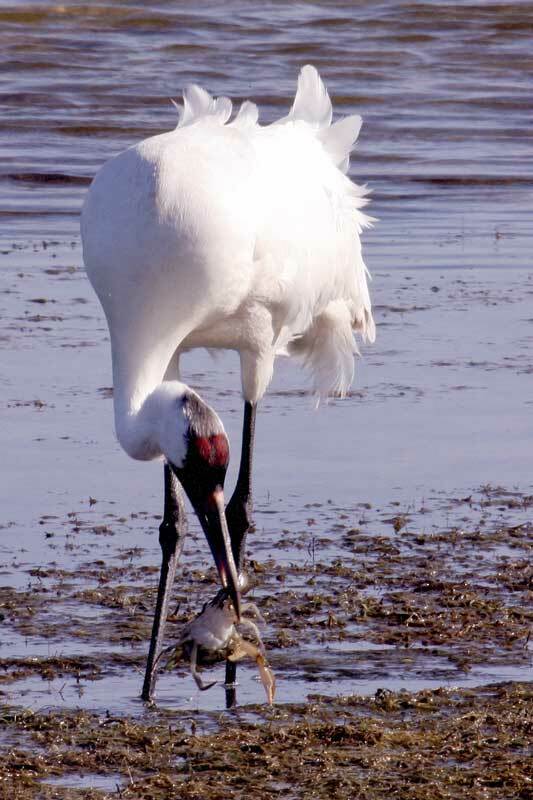 An example of lost energy happens when a whooping crane eats a blue crab. (Fig 5.5) The crane gets any energy that’s in the crab’s body when it gets eaten, but the crane doesn’t get the energy the crab spent that day walking on the bottom and swimming around the wetland using its swimming legs before it was eaten. That energy is lost. An energy pyramid illustrates this lost energy by showing each higher trophic level having a smaller volume than the one below it. Most of the available food energy in a food chain is lost moving up each trophic level. For example, it takes about 3,200 pounds of microscopic plants to produce 410 pounds of microscopic animals. Those 410 pounds of microscopic animals can feed 58 pounds of crayfish, snails, mussels, clams, and aquatic insects. Those animals may in turn be eaten by up to 8 pounds of bluegill. Eating 8 pounds of bluegill will allow a largemouth bass to grow by about 1 pound. An environment can support only a certain amount of life at each step of the energy pyramid. 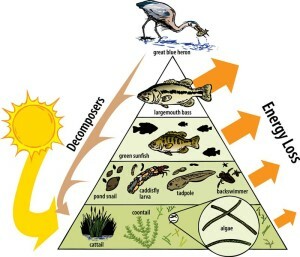 The higher up the energy pyramid an animal feeds, the fewer of this kind of animal the environment can support. Most energy pyramids can continue for only four or five trophic levels and can support only a few top-level consumers. In Texas’ reservoirs, for example, largemouth bass and striped bass often occupy the top level of the food chain. These top-level predators are fewer in number than smaller fish species, invertebrates, or aquatic plants. In large aquatic ecosystems, such as the Gulf of Mexico, most of the energy in the system comes solely from within the system. In smaller systems such as freshwater streams, much of the energy used in the ecosystem comes from plant and animal matter that falls into the water. This comes from the stream banks, riparian vegetation, and things that get blown or thrown into the stream. Aquatic species must compete for aquatic resources to survive. One adaptation that reduces some of the stress of competition is for species to specialize in the way they get their food. We can think of water in a column. Fish that feed on insects that fall in the water from vegetation along the shoreline or stream bank often eat near the surface. Fish that prey mostly on smaller fish may roam throughout the water column. Some fish, such as catfish, feed near the bottom. Feeding at different levels in the water column helps one fish species reduce competition with other species. Feeding specialization helps a species to fit into a particular niche. Predation is a form of competition. Both predator and prey are competing against one another for survival. The predator wants to eat the prey, while the prey wants to keep from being eaten. This is a life or death struggle for both predator and prey. To complicate matters, a species may be both a predator and prey at the same time. Many fish species shift from being prey when young and small, to being a predator when older and larger. Some species, such as bass, even prey on their own young. Predator-prey relationships develop naturally within a community. It’s a balancing act as the numbers of predators and prey vary over time. The process is essential to keeping the populations of organisms at about the carrying capacity of their habitat. Here is an example of how changing the balance between predators and prey can affect an aquatic system. Largemouth bass are a predator and bluegill are their prey. Catching and removing all the largemouth bass in a pond leads to an overabundance of bluegill, since bass are no longer eating bluegill. No longer being eaten by bass, the bluegill quickly overpopulate their habitat and exceed its carrying capacity. The now large number of bluegill quickly eat all of their available food, such as all the appropriately-sized aquatic insects and zooplankton. Without the zooplankton grazing on the phytoplankton (algae), the algae quickly become overabundant. The pond then turns green and turbid with algae. The algae grows too rapidly and uses up all the available plant nutrients in the pond water. Without nutrients, the overgrown algae dies all at once. Decomposers such as bacteria then feed on the dead algae forming large amounts of detritus. Decomposition of the large amount of detritus uses up all the dissolved oxygen in the water. With little dissolved oxygen in the water, bluegill in the pond become overabundant, grow very slowly, and may even die if oxygen levels get too low. But channel catfish survive, because bluegill require more dissolved oxygen than do channel catfish. The lesson of this example is that by simply removing a single species from the pond, such as the predatory largemouth bass, the entire aquatic community can undergo profound change affecting many other species. Competition between individuals of a species is the driving force behind natural selection. Natural selection is the process whereby some individuals live to reproduce in their environment while other individuals do not. Natural selection ensures that, in general, only the best-adapted individuals survive and reproduce. Natural selection happens as individuals of a species compete for resources, such as food, water, territory, sunlight, or attracting mating partners. Where individuals of a species vary in characteristics that provide advantages, these individuals “win” because they are the ones best suited for survival in their environment. The tendency for the most adapted organisms to survive and reproduce helps the population to pass on useful traits and abilities to future generations. Although it’s not always clear what will be advantageous at any point in time or in different places. For example, having the ability to withstand low dissolved oxygen is not an advantage if you are a fish that lives where there is always plenty of dissolved oxygen. As a result, certain characteristics of individuals of a species change over time as the species adapts to the environment in which it lives. All aquatic plants and animals, including fish, have adapted characteristics over millions of years that allow them to live in today’s aquatic habitats. Although having biodiversity in an ecosystem is important, sometimes new species are introduced into an environment that do not belong there. These are species that naturally occur outside of Texas or even outside of North America. When a species of foreign origin is introduced into a new habitat it is called an exotic or nonindigenous species. Sometimes these species don’t live because some of the resources they need to survive are not in the new habitat in which they have been introduced (e.g., food, shelter). But when nonindigenous species do have the resources they need to survive in the new habitat they can become invasive. An invasive species will typically reproduce quickly, consume resources faster than native species, and are not subject to control by native predators. Invasive exotic species can cause damage to native aquatic habitats and even drive some native species to extinction. Lionfish, native to the Indo-Pacific, are now thriving in the Gulf of Mexico and eating our native reef fish. Giant salvinia can now be found on Caddo Lake. (Fig. 5.6) This is an example of an invasive exotic plant that is causing problems for native species in Texas reservoirs. Fig. 5.6 — Non-native invasive species threaten Texas’ native aquatic ecosystems. A species is considered to be invasive if it outcompetes native species. They may compete with native species for habitat, food, or both. This competition makes it harder for the native species to survive. 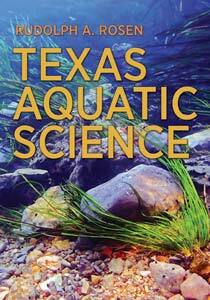 Over time, invasive species may adversely change native Texas aquatic communities. As a result, native species can become endangered and the invasive species can spread throughout the state. 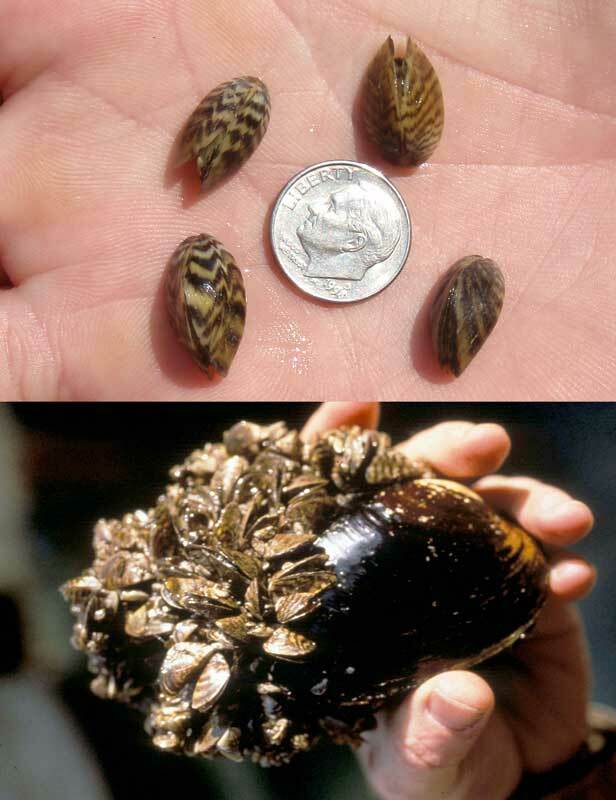 The tiny zebra mussel shown here has grown in massive numbers, infesting Lake Texoma in north Texas (many zebra mussels are shown clinging to the shell of a common Texas river mussel). Zebra mussels can attach to any hard surface. They clog water intakes, cling to boat hulls, damage engines, and infest boat docks, ramps, and navigational buoys.